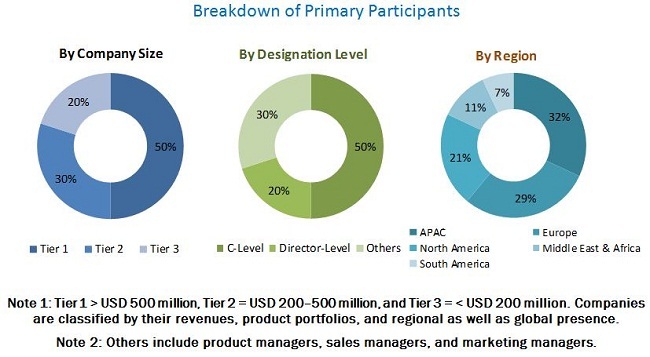 [134 Pages Report] global heat stabilizers market was valued at USD 3.63 Billion in 2016 and is projected to reach USD 4.57 Billion by 2022, at a CAGR of 4.0% during the forecast period. In this report, 2016 is considered the base year and the forecast period is 2017 to 2022. APAC is the fastest-growing market for heat stabilizers due to the technologically advancing and emerging countries in the region demanding innovative, lightweight, renewable, and less toxic heat stabilizer products. Key manufacturers of heat stabilizers include Clariant International Ltd. (Switzerland), Valtris Specialty Chemicals (US), Baerlocher GmbH (Germany), and Reagens S.p.A. (Italy). This report categorizes the global heat stabilizers market by type, application, and region. 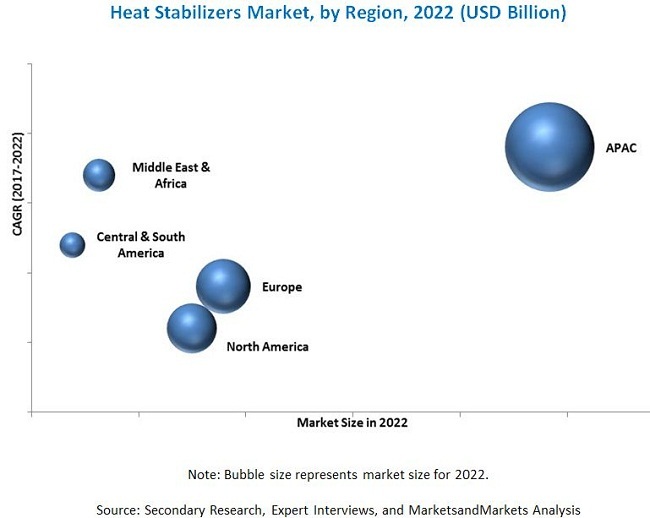 The global heat stabilizers market is estimated at USD 3.77 Billion in 2017 and is projected to reach USD 4.57 Billion by 2022, at a CAGR of 4.0% during the forecast period. The increasing demand for organic-based solutions primarily in the packaging and medical industries is expected to drive the growth of the global heat stabilizers market. Based on type, the global heat stabilizers market has been segmented into metal soaps and organotin. The liquid mixed metals type under the metal soaps segment is projected to grow at the highest CAGR due to enhanced functionality and better characteristic properties. Liquid mixed metal heat stabilizers find major use in window profiles, sidings, coatings & floorings, and cables applications. Based on application, the global heat stabilizers market has been segmented into pipes & fittings, profiles & tubing, wires & cables, coatings & floorings, and others. The pipes & fittings application accounts for a significant demand for heat stabilizers, as construction is the largest industry using PVC materials blended with heat stabilizers in pipes. Heat stabilizers in PVC show enhanced properties as compared to conventional materials such as glass, wood, or metals in terms of weatherability, transparency, design flexibility, and durability. By region, the global heat stabilizers market has been classified into APAC, Europe, North America, Middle East & Africa, and Central & South America. APAC was the largest market for heat stabilizers in 2016 and is projected to lead the heat stabilizers market during the forecast period. The APAC heat stabilizers market is largely driven by the increasing construction activities, leading to an increase in the use of lightweight and high-quality construction materials made of PVC, which is further increasing the use of heat stabilizers. The major factor restraining the growth of the global heat stabilizers market is the presence of stringent regulations pertaining to the use of toxic materials. The use of metals such as lead, cadmium, and butyltin pose serious harm to the human health. They also accumulate in the environment. Thus, many governments have limited or banned the use of such materials to lessen the harmful effects on environment. Some of the key players operating in the global heat stabilizers market are Baerlocher GmbH (Germany), PMC Organometallix Inc. (US), and Adeka Corporation (Japan), among others. 10.4 Songwon Industrial Co. Ltd.